Filed to: Battery!Filed to: Battery! Popular Mechanics reports on The US Army's new a hybrid-electric drivetrain, which is battery-dominant and employs a diesel engine as generator. 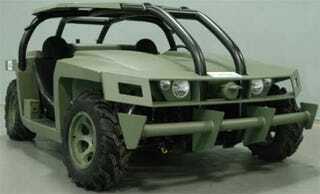 It's the driving force behind the Aggressor, the latest in a string of prototype alternative mobility vehicles (AMVs) for military ground operations requiring speed and stealth, such as recon and surveillance. By way of the e-motor's massive torque, the Aggressor can get from zero to 40 mph in four seconds and tops out at 80 mph. It also sports a "silent mode" giving the high-tech jeep a lower thermal signature, and making it less detectable to night vision specs. And maybe if it proves itself on the mean streets of Baghdad, some rich Austrian dude will order one for civilian use, sparking a revolution in the SUV market. Hey, it could happen. Bon Soir, Mofos: It&apos;s the VBL!